The following is a guest post about narrowing down job offers. If interested in submitting a guest post, please read my guest post policy and then contact me. The ultimate goal for any job seeker in New York is to finally land their dream job at a company that treats them with the respect they deserve. The first step in the process is to find a job in New York through a reputable website. Some job seekers will land their first interview in just a matter of hours, while others will find themselves submitting resumes for weeks at a time. When job offers start coming in, however, it is not always easy to make a final decision on which company to choose. Below are some things to consider when narrowing down job offers. The salary that you earn must be one of your biggest concerns. In a perfect world, job seekers would choose their employment based on their interests and passions. In the real world, however, you have to consider whether or not the job will provide you with the salary you need to maintain your lifestyle. Does this mean that you should automatically choose the offer with the highest salary? Not necessarily. If the job requires you to relocate, you need to consider the cost of living in that location. A higher salary may come with a higher cost of living. Some companies are going beyond health and retirement benefits by offering additional perks. For example, some provide catered breakfasts and lunches for free. Others have an onsite gym that employees can use and a variety of other special benefits that may make your job more enjoyable and improve your quality of living. Consider these extra perks when comparing offers. It may be the deciding factor in some cases. Naturally, you should ensure that the company will offer you adequate health insurance to meet the medical needs of you and your family. This may also be a deciding factor as many companies will offer similar salaries but different benefit options. Consider this part carefully when comparing offers as it will directly affect the quality of medical care you receive. 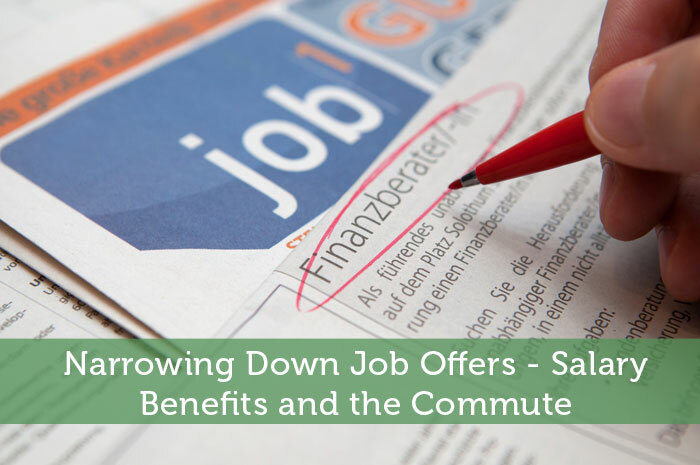 Commuting distance is something that concerns most job seekers. If you don’t mind a long commute, this may not be a problem, but most people would prefer to keep their morning drive to less than one hour. If you do not have your own vehicle, you need to consider whether or not the job is located close enough to public transportation options. For example, taking a job offer for an office in a rural community may not be the best option for someone without their own transportation unless they have already made arrangements to commute with another person. Is the Job Environment Suitable? When going in for your initial interview, you likely had the chance to meet with a few other staff members. These individuals are your potential co-workers. Can you see yourself working with these people, or would you find yourself spending most of your time alone and isolated in the office? The work environment is just as important as anything else. You need to feel comfortable and confident in your work environment. I don’t think enough people consider the commute, but more importantly, the culture. If the company doesn’t have a culture that fits you, no matter how much money you make, you won’t be happy. People sometimes forget to focus on more than money and benefits. Those other factors can definitely negate things such as salary and benefits. You have to be at least somewhat happy with your job. If not you will either be miserable or need to leave the job prematurely. the commute is a really big deal if you value your time. Sure you can read or rest in the train but it makes for a very long day. I’d rather make less and work close from home. I really don’t understand how some people do a long commute to and from work everyday. My public transit commute is fairly long, but it was a conscious decision knowing where I could afford a big enough condo and where the jobs are. It’s so important to remember to factor in your commute time and what kind of benefits you’ll receive! In many cases, time is just as valuable as money, so it’s important to evaluate that (especially if you have to drive – I can see where taking the train or bus makes a commute worthwhile because you can get stuff done while you travel back and forth). And when it comes to benefits, those can make a lower-paying job come out on top of a higher-paid one if you have great perks and options. Driving a long commute is certainly a lot worse than a long transit commute. If your drive is long it can be the difference between working a 40 hours/week job and one that seems like 50+ hours/week. The commute is very important for me because of the time spend away from your family. In order, for me to keep a job where the commute is far I need to find a job that has tons of perks. Yes there can be some perks that make up for a long commute, but usually it is just not worth it. I think many people dismiss benefits as being part of the compensation package. You light have a job offer that is less salary-wise than another, but if that lower paying job is offering you an extra week vacation and better insurance, that job may be better. Never base your decision off of salary alone, take into account benefits. Yes some of those benefits could improve your net salary or could make you overall happier. A job decision is definitely more than just comparing one salary to another. Then again the job with the higher salary could be a good stepping stone to get the best of both worlds at the next job. No doubt salary is the big part of the decision. BUt personally i prefer the work culture and brand of the recruiter. Work culture is pretty huge. Why bother make more money if it means possibly being miserable when you go to work? Hey Jeremy, I like this one. We all think about money and commute, but very rarely do we think about the working environment. That’s gotta be one of the most important things for me. Thanks for the great read! Those experts are also easy to overlook when presented with the chance of earning a higher salary. Dollar signs can be a bit blinding, but if you do take the time to look at the big picture it can make you a lot happier and stick around that job longer. I don’t think I would like the idea of commuting. I prefer working nearer even with a lower pay rather than working far from our home. It won’t compensate the time and effort you will give when working on a far place. I wish I had that option, but realistically I’d have to switch careers or pay an absurd price for a condo. So I do have to put up with a fairly long commute. A lot of may time is wasted, but it could be worse. I know some people commute 2+ hours each way which sounds insane. Don’t forget that your salary should not only cover your lifestyle, it should also leave you something at the end of the month to build either an emergency fund or better yet a nice nest egg. Also don’t fall for the “your salary might be only X but we hand out big bonuses”. These bonuses tend to go away first when things go slightly south, make sure your base salary takes care of that lifestyle plus a little extra.